One hundred and seventy-eight years after the Cherokee Nation was removed from their homeland in Cherokee County, and 20 years after the 1995 Canton Walmart excavation, Reinhardt University’s Funk Heritage Center (FHC) hosted an open house and ribbon cutting for two new exhibits that include artifacts from the 1995 excavation. In 2014, $53,000 was raised by the Center to have 137 boxes of artifacts from the excavation curated at the University of Georgia Laboratory of Archaeology where they will be preserved. 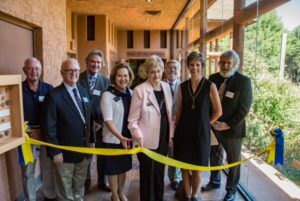 The Center then raised $100,000 in 2015 to design and install the new exhibits. A museum design team worked on this project with museum staff and two new exhibits opened in the Hall of Ancients September 30, 2016. A third exhibit about Cherokee Life will open in 2018. Pictured from left, Skip Spears (Chairman of FHC Advisory Committee) Dr. Joe Kitchens (Director of the Funk Heritage Center), Billy Hasty (Chairman of the Reinhardt Board of Trustees), Dr. Kina Mallard (Reinhardt President), Doris Jones (Waleska Mayor), Bill Brogdon (executive director of the Scott Hudgens Family Foundation), Rebecca McCallum (also representing the Scott Hudgens Family Foundation) and Dr. Mark Williams (Director of the University of Georgia Laboratory of Archeology). Imagine a trove of artifacts buried for as long as 2,000 years. Just such a find was made in Cherokee County prior to the Canton Walmart construction in 1995. Archaeologist Paul Webb (pictured below) was the first archaeologist involved in the excavation. He explained, "When contractors encountered archaeological materials, Walmart reacted as a good corporate citizen, suspending construction so a scientific excavation could be made. It was the hottest, driest summer I could remember, and the crews worked tirelessly to excavate the artifacts while construction of the site was put on hold. We prepared a plan that was accepted by the state and our crew of about 30 worked through the summer of 1995, right up until Labor Day. The conditions were challenging. We worked six-day weeks in 90-degree weather. Once excavation actually began, crews uncovered not only artifacts from the before the Cherokees were removed in 1838, but also some from Archaic, Woodland and Mississippian periods of time." The Department of Natural Resources (DNR) assigned an official name to the excavation site: “Hickory Log” after a small creek that enters the Etowah River there. The actual work was funded by the Army Corps of Engineers and accomplished by Archaeologist Webb’s Atlanta-based firm. Billy Hasty, Reinhardt University Board of Trustees Chair, was the Canton city attorney at the time and visited the site often. He recalled his amazement when he saw pottery and stone tools that dated to the time of Christ-and before-as well as the remnants of Cherokee life. He said, “It was incredible to hold in my hand an object used by Native people during the Mississippian, Woodland and Archaic periods of time." Later, Webb’s company was acquired by TRC Solutions and Webb relocated and took the artifacts with him to TRC’s facility in Chapel Hill, North Carolina. For eighteen years, he worked organizing and analyzing this and other collections. During this period of time, many area residents wondered what had happened to the artifacts that were unearthed at the Walmart site. Nobody seemed to know where they were! Newspaper accounts of the excavation were recalled but not the name of the archaeologist. It was a chance lunch meeting between Hasty and Dr. Joseph Kitchens,Executive Director of the Funk Heritage Center, that resulted in Kitchens locating Webb and the "Walmart artifacts" in North Carolina. Once the archaeologist was located, they contacted Webb late in 2010 and arranged a meeting with him in early 2011. A delegation from Reinhardt University, including members of the museum’s Advisory Board, went to Chapel Hill to see some of the artifacts in the collection. 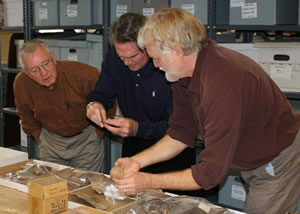 Pictured right (l to r) are Skip Spears, Billy Hasty and Paul Webb looking at some of the artifacts. The group left the meeting hopeful that a way could be found to acquire and exhibit some of these artifacts in the Funk Heritage Center—to bring them back home tp Cherokee County. 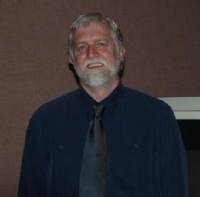 In March, 2012, Webb presented a lecture on the excavation at the Funk Heritage Center and displayed some artifacts found at the site. He said that more than 100,000 artifacts from the banks of the Etowah River had undergone study and analysis. Ancient pottery, pipes and 19th century remnants of the Native American presence in North Georgia were among the sampling of objects collected by Webb and his crew. He brought examples of the collection and lectured on the significance of the study that had consumed almost half his professional life. An interested audience from Cherokee and surrounding counties turned out to hear what Webb had to say. He was enthusiastic about returning the collection to Georgia. However, he pointed out that other entities would need to be involved in any agreement, including the Corps of Engineers and officials at Georgia DNR. Meetings with Georgia officials underscored the importance of professional curation of the objects to meet guidelines which are set by federal regulators making this an expensive project. 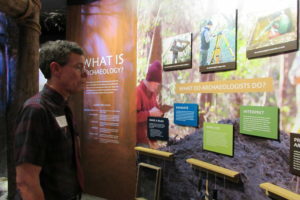 Following that trip to North Carolina, Dr. Kitchens contacted Dr. Mark Williams, the Director of the University of Georgia Laboratory of Archaeology. They worked out an arrangement whereby the artifact collection could be curated and preserved there once funds were raised to pay for the curation. Next, Reinhardt representatives and museum staff began working to raise the needed funds. Kitchens said, “The Hickory Log site was an ideal place to search for Native American artifacts. The valley of the Etowah River has been home to people for more than two thousand years. Archaeological excavation revealed evidence of at least five periods of occupation before the historic times when whites first explored the area. Webb’s work on this project included identifying the artifacts and sorting them in a way that could reveal the secrets of several past cultures." Once funds were raised to curate the artifacts, they were relocated from North Carolina to the Athens, Georgia UGA Laboratory in 2015. Work then began designing new exhibits in the Hall of Ancients at the Funk Heritage Center. Staff from the Laboratory of Archaeology assisted museum staff in selecting and interpreting some of the best artifacts in the collection for display in the exhibits. History Beneath Our Feet focuses on the artifacts and archeological aspects of the full exhibit. 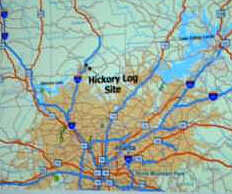 “It has been nearly 20 years since the recovery of the Hickory Log artifacts began. Excavation of the Canton Walmart site yielded thousands of artifacts, some more than 2,000 years old,” Dr. Joseph Kitchens, Executive Director of the Center, said. “Raising over $50,000 for the curation and another $100,000 for the exhibition of some of these artifacts, has consumed the museum staff’s efforts for the past five years. Volunteers, donors and members have made it possible to recover evidence of Cherokee County’s past. We have now completed the first exhibits featuring this material, with another to follow in 2018 focused on the Cherokee period of occupation of the site.” The Life Along the Etowah exhibit focuses on the environmental aspects of the area and Diane Minick, executive director of the Upper Etowah River Alliance, played an instrumental role in putting the exhibit together. Donations included an up to $50,000 matching grant from the Scott Hudgens Foundation, as well as from other generous donors. “They have dreamed and planned and raised money,” said Reinhardt President Dr. Kina Mallard. “Anything we can do to enhance this treasure for Reinhardt, for Waleska – we thank those who have contributed toward this vision.” Billy Hasty said, I can say that this is a day that I wondered at times if it would ever materialize. We really didn't realize what we had until we went to the University of Georgia and Dr. Williams said these artifacts are as good as you will find anywhere. This is such an honor. I can't tell you how proud I am that we have this at Reinhardt." Finally, Waleska Mayor Doris Jones said, "I know how hard some of you have worked. Just know that our city of Waleska is a better place because of Reinhardt University and the Funk Heritage Center." A resolution of the National Committee and Council of the Cherokee Nation declared the Hickory Log District on October 25, 1820. Beginning at the head of Potatoe Mine creek, on the Blue Ridge, thence to where Cheewostoye path crosses said ridge, and along the said path to the head branch of Frog Town creek, and down the same to the confluence with Tahantee; thence down the same to the Shallow wagon ford on said river above the standing Peach Tree; thence westward along said wagon road leading to _____ Town, where it crosses Little river a fork of the river, and down the same in direct course to a large creek, and up said creek to where the road crosses it to the opposite side, and to be bounded by third district."